With the rapid development of communication and information technologies, the systems with compact size and multiple functions combining communication, computing, and entertainment are the future trend. Several technologies enable this trend, such as system in package (SiP), system on chip (SoC), and 3D-IC with through silicon via (TSV). However, the operation frequency of the differential signals will be over 20 GHz in 2020. Integration of digital circuits, RF/MW circuits, and memory chips in such small area will cause significant noise coupling and EM or RF interference (EMI/RFI) problems. The NTU EMC research group aims to be the world leader in developing the novel technologies or solutions of the noise mitigation and RF/MW components development for the next generation electronic systems based on SiP, SoC, or 3D-IC technologies. As shown in Fig. 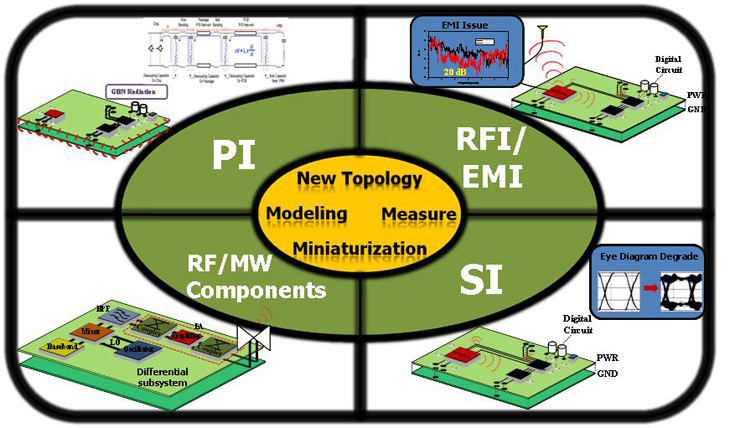 1, our research covers four main topics: Power Integrity (PI), Signal Integrity (SI), EMI/RFI, and RF/MW components. The core competence NTU EMC group possess is high-frequency modeling/measurement, novel topologies, and miniaturization skill. The core competence keep our group in developing the state-of-the-art technologies on these four research topics.